No matter how familiar you are with lawn mowers, it's always important to keep safety in mind when operating one. Following safety precautions will help reduce your risk of injury while preventing damage to your mower and other property. You should always read the operator's manual that comes with your specific make and model of your lawn mower, tractor or zero turn. Every model has different features and a different design. Knowing safety features and warnings specific to your mower can help to prevent injuries and accidents from occurring. Because loose pants, sleeves, and jewelry items have a propensity to get caught in your equipment's moving parts, you should wear clothes that fit properly -- not too loose or too tight. Dress comfortably, but safely. Close-fitting clothing will reduce your chance of injury by entanglement. 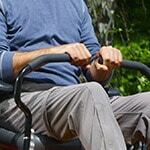 Long pants are recommended to help protect your legs from flying debris as you mow and trim. Strong, tough, non-slip boots are recommended as well to protect your feet and reduce your chance of slip-and-fall related injury. Tennis shoes and sandals are not safe to wear when operating a lawn mower. Sandals offer no protection for your feet, and tennis shoes can get tangled in the blades. Facial protection -- such as a face shield and/or safety glasses -- is recommended to protect your eyes and face from flying debris. 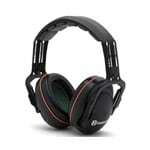 To prevent hearing damage from long-term exposure to loud noise, we recommend you wear hearing protection. You can use ear plugs, or opt for a more comfortable option and wear ear muffs that cover the ears entirely and muffle loud noises. Wearing protective gloves and eye wear, inspect your mower's belts, blades, and fluids. Because loose belts can slip, break, or become hot during use, you should change loose or worn-looking belts right away. Leaving a worn-out belt on your mower could result in injury or damage to your mower should it break or overheat due to friction. Making sure you have your protective gloves on, inspect the mower blades. Be sure the mower is turned off completely prior to inspection. Ensure that your mower's blades are tightly secured and well balanced. Ensure there are no cracks, and that the blades are not excessively worn. Weak, cracked, or loose blades could result in them being launched -- causing serious injury or property damage. Inspect your fluids to ensure they're at the proper levels, and that there are no leaks. Fluid leaks are a potential fire hazard, and low fluid levels could result in engine damage or breakdown. Clean off any areas of the mower that have caked-on grass clippings, dirt, debris, or leaves. Build-up of debris can pose a fire hazard around moving parts. Wipe your mower clean between uses to help reduce corrosion, fire hazard, and possible breakdown. 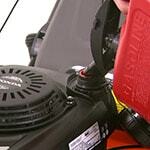 When fueling your lawn mower, always be sure the engine is shut off, and that it's had ample time to fully cool prior to filling your fuel tank. Pouring fuel into the tank while the engine is hot poses a serious risk. Always wait for the engine to cool before fueling. To prevent static from sparking and igniting the fuel when refueling, touch the fuel nozzle to the mower before removing the fuel cap. This will help to neutralize any static charge. And you should never smoke or introduce any open flame near the fuel or fuel tank. Store your gasoline in an approved fuel container, and store it out of direct sunlight in a well-ventilated area. Use a funnel when refueling, and maintain consistent contact between the funnel and the fuel tank during refueling to prevent generation of static electricity or spillage. Wipe up any drips or spills before starting the engine. All fuel should be contained only in the fuel tank or storage tank upon start-up. And when starting your mower, only start it outdoors in a well-ventilated area. Exhaust fumes contain carbon monoxide, which is a tasteless, odorless, and extremely dangerous gas. Inhaling concentrated carbon monoxide is deadly, so roll your mower outside prior to starting it. When operating a riding mower, lawn tractor, garden tractor, or zero turn mower, always wear a seat belt so you don't fall off. Only mow up and down the faces of slopes to prevent rollover. 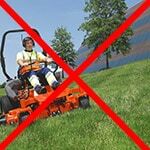 Never drive a mower across the face of a slope, as it leans the mower to one side and greatly increases the likelihood of rollover. You should also be careful not to make any sudden or sharp turns, and don't take off too quickly. When operating a walk-behind mower, the opposite direction is recommended. Mow along the faces of slopes to prevent injury. A slip and fall while mowing in an up-hill fashion could cause the mower to roll back and onto you. A slip and fall while mowing in a down-hill fashion could cause you to slip into the mower or lose your hold on it and leave it rolling downhill. A good rule of thumb is to keep your hands and feet where they are meant to be at all times. On walk-behind mowers, keep both hands on the handlebar while in use. Do not remove one hand to lift and turn the mower, or you could turn it too far and drop it down on your foot. Never tilt-lift the mower at all while blades are engaged. Keep all wheels on the ground while making turns to avoid injury. Do not attempt to unclog the discharge chute while the machine is running. The blades are directly behind the discharge chute, so you should never lift the discharge chute deflector during operation. Also, do not attempt to work on or make adjustments to the machine while it's running. Avoid mowing in reverse with walk-behind mowers, as you could unintentionally drag the mower back over your feet. Always mow in a forward motion. The same generally goes for lawn tractors and other riding mowers. While you aren't likely to catch your feet under it, you may not see someone or something behind you while in reverse. Disengage the blades prior to reversing. We don't recommend mowing on wet grass. One reason is because you'll get better results if you mow your grass while it's dry. More importantly, wet grass can cause slipping. This goes for walk-behind mowers as well as riding mowers and tractors. Operating walk-behind mowers on wet grass can cause you to slip into the mower. Operating riding mowers and tractors on wet grass can cause the machine to slip and throw you out of your seat. Lawn Mower Safety.. Our Power Equipment Direct how-to library can help you learn about How to Fertilize Your Lawn, Vote for Your Favorite Brands in Mower Madness 2019 and Official Mower Madness Contest Rules.